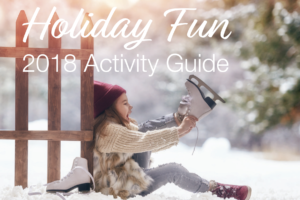 You are here: Home / Uncategorized / Your Holiday Activity Guide is Here! There’s something magical about the holiday season…It’s almost as if this time of year waves a magic wand over the world and everything becomes a little brighter, happier and more beautiful. For some of us, this season is synonymous with childhood—where carefree days and innocence reigned. For others, this season gives the gift of family, love and lasting traditions. Whatever the reason may be, there’s no denying that this time of year has something valuable to offer us all! In honor of this magical season and all of the joy and happiness that it brings, we’ve put together a “Sacramento Holiday Activity Guide” that is packed with fun and festive events, activities and more. Read on to see what Sacramento has in store for the remainder of the year! About this event: Standing center stage at Front Street & K Street in the Old Sacramento Waterfront district, the 60-foot tall Old Sacramento Waterfront District Holiday Tree will be lit for the first time on Wednesday at 6 pm. Special performances will begin at 4 pm. About this event: Enjoy hot chocolate and yummy cookies as you ride along with many of the story’s characters such as the Train Conductor, the Dancing Waiters, and a ghostly Hobo. Once you reach the North Pole, the jolly old elf — Santa himself — will come on board to give each passenger a silver sleigh bell, the “first gift of Christmas”. About this event: Located blocks from the renowned Golden 1 Center, the Old Sacramento Waterfront district transforms into a 19th-century winter wonderland as 150,000 spectators from all over the region visit to watch the light show spectacular and unique retelling of the American classic “Twas the Night Before Christmas.” Shows will be held every Thursday through Sunday at 6 and 7:30 PM with only one show at 6 PM on December 24th. About this event: This holiday season, share your cookies with Santa Claus, his elves and Skippy the reindeer aboard the Magical Christmas Train. We bring Santa right to your seats, so you can skip the lines and experience Christmas through the imagination of a child. About this event: Celebrate the holiday season at Fairytale Town with festive décor and a dazzling display of lights! Visit with Santa in his workshop from 3 to 6 p.m., don’t miss a flurry of snow falling nightly at 7 p.m., step inside a giant snow globe, and enjoy Charlie Brown-themed hands-on activities! About this event: On Christmas Eve, Fairytale Town gives the gift of free admission to visiting guests. Sponsored by Access Dental, Health Net, and Liberty Dental. About this event: Join Sacramento Food Bank & Family Services (SFBFS) for the 25th annual Run to Feed the Hungry event to take place on Thanksgiving Day. This annual family-friendly fundraiser supports families in need and all donations go to the SFBFS. Two race lengths are offered to suit participant needs. Show your support and participate this year! About this event: Fairytale Town offers FREE admission to visitors who bring in a canned good to donate the day after Thanksgiving! All goods collected will be donated to the Sacramento Food Bank & Family Services, Spirit of Giving Holiday Drive. About this event: It’s back and bigger than ever! Save the date for the 2nd annual Sacramento SPCA Jingle Bell PUP Crawl, Saturday, December 8, from 12:00 – 4:00 pm. Enjoy drink and food specials, photos with Santa Paws, and holiday activity stations at each Pup Crawl stop. Your ticket purchase supports the animals at the Sacramento SPCA. It’s going to be PAWS-itively delightful! Your entry includes a Pup Crawl t-shirt, jingle bells for your pup(s), holiday doggie bag, drink and food specials and a commemorative crawl KOOZIE. About this event: The Arthritis Foundation’s original Jingle Bell Run is a fun way to get decked out and be festive, while racing to raise funds and awareness to cure America’s #1 cause of disability. Put on your favorite holiday costume. Tie jingle bells to your shoelaces. ’Tis the season to live it up and be jolly for a reason! Bring a team of friends, family and co-workers to run or walk, spread smiles and good cheer … and be a Champion of Yes! 100 percent of your registration fee and fundraising efforts go to this great cause. About this event: The tour will feature the newly announced line-up of Mick Fleetwood, John McVie, Stevie Nicks, and Christine McVie along with newcomers Mike Campbell and Neil Finn. About this event: Sacramento’s premier Alternative Christmas Show is coming back! Electric Christmas will return to the Golden 1 Center on Thursday, December 6th. This year’s lineup includes 30 Seconds to Mars, Sublime with Rome, Elle King, Matt and Kim, and The Crystal Method! About this event: In this charmingly imagined sequel to Pride and Prejudice, Mary Bennet is growing tired of her role as dutiful middle sister in the face of her siblings’ romantic escapades. When the family gathers for Christmas at Pemberley, an unexpected guest sparks Mary’s hopes for independence, an intellectual match, and possibly even love. This romantic comedy picks up two years after Jane Austen’s beloved tale ended, with a clever and captivating style that will delight Austen aficionados and newcomers alike! About this event: Enjoy an elegant evening beginning with cocktails and exquisite dining presented by Paula LeDuc Fine Catering. A spirited live auction of coveted items and exclusive experiences, followed by an after party in the Museum’s historic ballroom, with late night bites and libations and dancing to seven-piece band Clean Slate. Funds raised help make art accessible to everyone in the community, including visitors with visual, auditory, physical, and learning or developmental differences, and sustain programs for youth, families, and school children. About this event: The return of this hilarious adaptation of Dickens’ classic story, Ebenezer Scrooge has had enough of his yearly redemption and does everything he can to bust out of it. All the familiar characters are present as he fights his way through the night, providing fodder for his disdain but also pushing him, reluctantly, to his absolution. About this event: Celebrate the holidays with LeAnn Rimes, an internationally multi-platinum selling acclaimed singer and ASCAP award-winning songwriter! Globally, she has sold more than 44 million units, won two Grammy® Awards; 12 Billboard Music Awards; two World Music Awards; three Academy of Country Music Awards; one Country Music Association Award and one Dove Award. At 14, Rimes won “Best New Artist” making her the youngest recipient of a Grammy® Award. About this event: Archival Gallery is celebrating the spirit of Christmas with a group show, Here Comes Santa Claus. Exhibition runs December 4 – 22. Join us for a Second Saturday reception on December 8 at 6PM featuring complimentary refreshments and an opportunity to meet the featured artists. About this event: Amy Seiwert’s new take on this Sacramento tradition. Join Marie and her Nutcracker Prince as they travel through the Land of the Snow to the Kingdom of Sweets. Featuring the Sacramento Philharmonic at select performances. Do you have any favorite holiday events in the Sacramento area? Let us know in the comments section below! "Diane Babcock is everything you look for and hope to find in a realtor. She is proactive, intelligent, trustworthy, and represents her clients with... continued"